Contest | Win Tickets to Freaky Deaky in Chicago & Milwaukee! Attention all Freaks, Journalist Without A Beat wants to send you and a buddy to the “Midwest Halloween Takeover” known as Freaky Deaky. 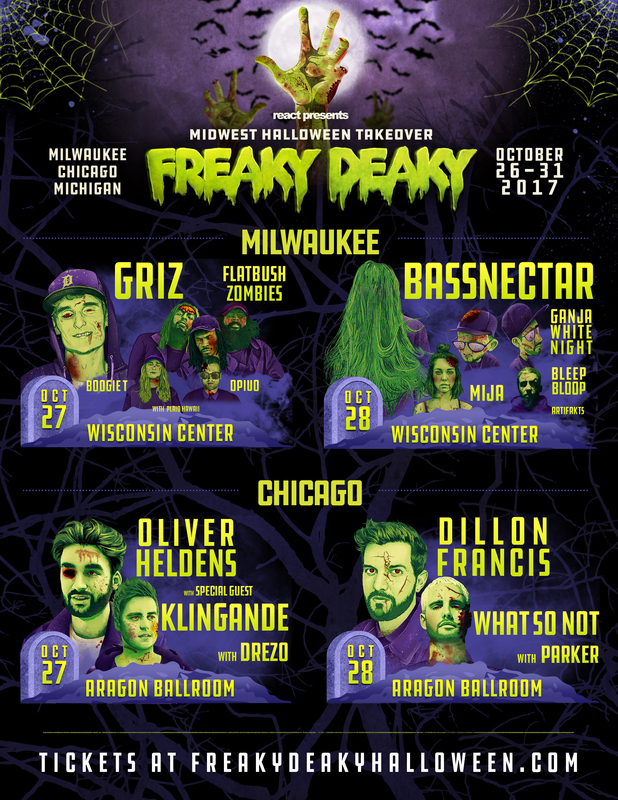 Thanks to the awesome people over at React Presents, not only do you have a chance to attend Freaky Deaky in Chicago for two amazing nights at the Aragon Ballroom, headlined by Oliver Heldens and Dillon Francis respectively – but for the first time ever, Journalist Without A Beat is giving away a second pair of tickets to Freaky Deaky for both days in Milwaukee! Freaky Deaky in Milwaukee will be held at the Wisconsin Center, featuring the likes of Griz, Flatbush Zombies, Bassnectar, Mila and more. Tag a Friend, comment the city where you want to experience Freaky Deaky and your fave Halloween memory. Good luck! The contest ends October 20th. Did you know it takes only 90 minutes from Chicago to Milwaukee via Amtrak? Not only is the train ride a breeze, but it drops you off minutes away from the venue. So if you plan on traveling from Chicago to the Wisconsin Center, this video is for you! Tickets to Freaky Deaky are available now, but as you can imagine they are going fast. You purchase tickets here. Plan on booking a hotel in either Chicago or Milwaukee? JWAB has you covered, check out the discounted hotel packages here. Freaky Deaky will run from October 27th-31st in Milwaukee, Chicago, and Michigan. Must be 17+ to enter. Contest ends October 20th. Winners of contest will receive (1) pair of tickets to Freaky Deaky on October 27th-28th in either Chicago or Milwaukee. Tickets are not transferable and will need to be picked up by the winner on the day of show with valid photo I.D. in order to claim their tickets. Winner will be notified on the day contest ends. If said person doesn’t respond in a reasonable time, a new winner will be chosen. Journalist Without A Beat Contest | Win Tickets to Freaky Deaky in Chicago & Milwaukee!